Is ”a gift from God for our times”, great mystic, mistress of spiritual life, prophet, who reminded the biblical truth about merciful love of God for every human being and calls to proclaim it to the world through the testimony of life, deed, word and prayer. Apostle of Divine Mercy, Prophet of Our Times, Great Mystic, Mistress of Spiritual Life – these are the epithets usually appended to the name of Sister Faustyna Kowalska, St. Faustyna (Faustina), of the Congregation of the Sisters of Our Lady of Mercy. Sister Faustina is one of the Church’s most popular and widely known saints and the greatest mystics in the history of the Church. 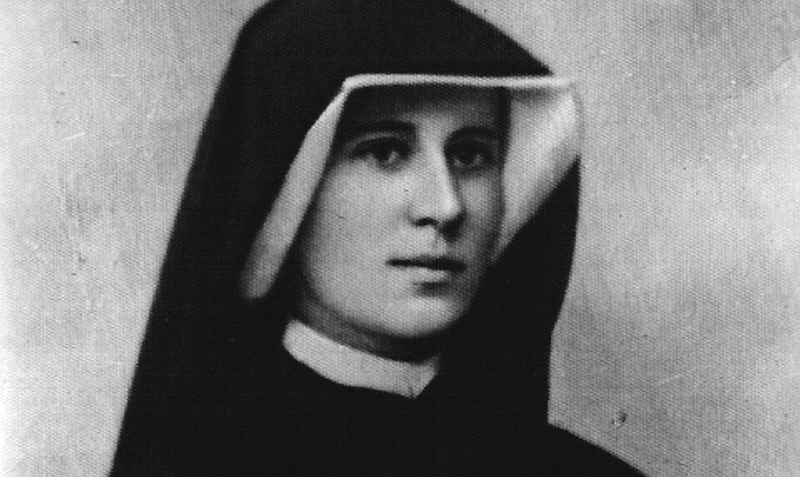 Sister Faustina was born on 25 August 1905 in Głogowiec, Poland to Marianna and Stanisław Kowalski as the third of ten children. Two days later she was baptized with the name Helena in the parish church of Świnice Warckie. At the age of nine, she made her first Holy Communion. She attended elementary school for merely three years and then she went to work as a housekeeper in various well–to–do families in Aleksandrów and Łódź. From the age of seven, she had felt the calling for religious vocation, but her parents would not give her permission to enter the convent. However, impelled by the vision of the Suffering Christ, in July 1924 she left for Warsaw to find a place. For another year she worked as a housekeeper to save some money for a modest monastic trousseau. On 1 August 1925 she entered the Congregation of the Sisters of Our Lady of Mercy in Warsaw on Żytnia St.
She lived in the Congregation for thirteen years, staying in many houses, the longest time (she spent) in Kraków, Płock and Vilnius; working as a cook, shop assistant in baker’s shop, gardener, and portress. She suffered from tuberculosis of the lungs and alimentary system and that is why for over 8 months stayed at the hospital in Kraków – Prądnik. Greater sufferings from those which were caused by tuberculosis, she offered as a voluntary sacrifice for sinners and as the Apostle of Divine Mercy. She experienced also many extraordinary graces such as: apparitions, ecstasies, the gift of bilocation, hidden stigmata, reading into human souls, the mystical betrothal and nuptials. Sister Faustina’s principal task was to pass on to the Church and world the Message of Mercy, a recapitulation of the Biblical truth of God’s Merciful Love for every human being, and a calling to each of us to entrust our lives to Him and to actively love our neighbour. Jesus not only revealed the depth of His Mercy to St. Faustina, but also gave her new forms of worship: the picture inscribed Jesus, I trust in You, the Feast of Divine Mercy, the Chaplet of Divine Mercy, and the Prayer in the Hour of His Death on the Cross, the Hour of Mercy. To each of these forms of worship, as well as to the preaching of the message of Mercy, He attached great promises, on condition that we care about the attitude of trust in God that is to fulfill His will and show mercy to our neighbours. Sister Faustina died in Krakow on October 5, 1938, at the age of just thirty–three. Out of her charism and mystical experience grew the Apostolic Movement of the Divine Mercy which continues her mission, proclaiming the message of Mercy to the world through the testimony of life, deed, words and prayer. On April 18, 1993, the Holy Father John Paul II raised her to the glory of the altars and on April 30, 2000, numbered her among the saints of the Church. Her relics are in the Shrine of the Divine Mercy at Łagiewniki, Kraków. The Holy Father John Paul II wrote that in the age of totalitarianisms Sister Faustina became the ambassador of the message that the only power strong enough to counteract their evil is the truth of God’s Mercy. He called her Diary a Gospel of Mercy written from a 20th-century perspective, which has helped people to survive the extremely painful experiences of these times. This message, Pope Benedict XVI has said, the message of Mercy as the Divine Power, as God putting a check on all the world’s evil, is indeed the chief message of our times.